Compact footprint? No problem. 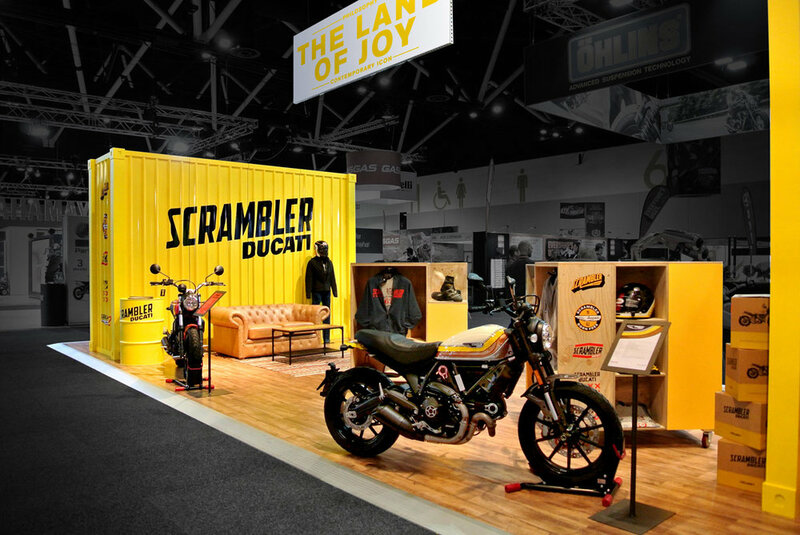 Our brief for Scrambler was the create a super-cool retail space in 75sqm for the Sydney Motorbike Show. As well as being amazing to look at, the stand had to be practical, with components that could be stored, shipped and easy reassembled for subsequent shows in Melbourne and Brisbane. While the Scrambler brand is distinctly different to its parent, Ducati, it still has a big personality. So does our stand. It features custom cladding to evoke the shipping-container aesthetic, rough-hewn plywood merchandising display units, eclectic furniture and accessories. Large hero images and bold logos add a brave touch to Scrambler’s branding. This vibrant stand attracts up to 25,000 people over 3 days at the annual Motorbike Show. As well as boosting brand visibility, the stand delivers outstanding return on investment. The modular walls, props and merchandising units can be repositioned to suit the different venues (and awe-inspiring bikes), year after year.